This is an adaptation of my mother's recipe which we just called Italian ham & cheese cake at my house. I found out this dish is traditionally called Pizza Rustica; which is a savory egg-based pie that is filled with cheeses and meats traditionally made on Good Friday and served on Easter to celebrate the end of Lent. 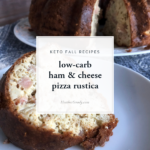 My low carb version does away with the carb-heavy crust; sorta like a frittata is to a quiche. 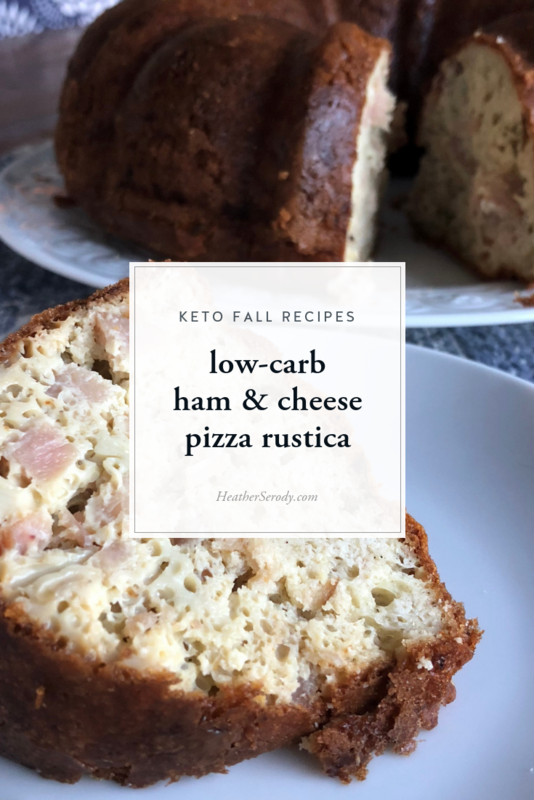 Despite the spring tradition I like to make this ham & cheese pizza rustica in the fall and eat it hot from the oven for lunch with a green salad. Feel free to experiment with a variety of cheese and meats like cheddar, ricotta, mozzarella, provolone, and Romano cheese combined with different savory meats like salami, and prosciutto, sausage, mortadella and soppressata. Grease and flour a tube/fluted bundt pan (9.5") or 9" souffle bowl with butter and a thin coating of almond flour. Set aside. Crack eggs into a medium sized bowl & whisk together well. Add half & half & whisk again. In a separate bowl add almond flour, salt, pepper, baking powder, & finely minced rosemary leaves. Whisk together until well-combined. Add the almond mixture to the egg mixture. Whisk together well. Add ham, parmesan, & cheddar cheeses & mix together until well-combined. Pour batter into the greased pan or bowl and place in the oven on the center rack. Cook at 350ºF for approximately 60-70 minutes, or until the pizza rustica is cooked through and browned at the edges. Remove from the oven and allow to cool for 10 minutes before turning out onto a serving platter. All the products I recommend from Amazon can be found on my Amazon Page – click here for convenient one-stop shopping.